Dams and Earthquakes deals with the association of earthquakes and large artificial lakes, particularly on the part that pore pressure plays in inducing earthquakes. 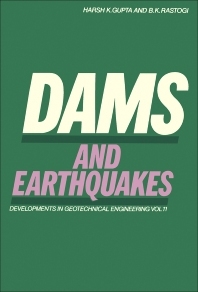 The book also contains methods for recording seismic activity, before, during, and after the filling of reservoir dams through the installation of a network of portable seismographs. The text assesses the parameters and macroseismic effects of the Koyna earthquake in India in December 1967, as well as the instrumental and macroseismic data showing that the Koyna earthquake is a multiple seismic event. The book investigates the geology, hydrology, and seismicity of seismic reservoir sites, including three cases of induced seismicity after fluid injections in deep wells. A possible correlation between the reservoir level or volume of the injected fluid and the tremor frequency exists. The characteristic seismic features of reservoir associated earthquakes can reflect changes in the mechanical properties of rock masses near the reservoirs. The book also investigates the part played by increased pore-fluid pressures in triggering the earthquakes at Denver, Rangely, Kariba, Kremasta and Koyna. The UNESCO Working Group on "Seismic Phenomena Associated with Large Reservoirs" recommends the adoption of a two-phase planning in instrumental studies and surveys at sites to be used for large reservoirs. The book can be beneficial for meteorologists, environmentalists, geologists, civil engineers, structural engineers, or for officers of river and lake authorities.